Traffic police personnel will be deployed in large numbers to ensure "minimum inconvenience" and "maximum facilitation". New Delhi, India: The Delhi Traffic Police has urged Google Maps to inform commuters about the traffic restrictions and alternative routes that can be availed on Republic Day as most roads will be either partially or completely unavailable due to the parade. On the occasion, foreign dignitaries from 10 countries will be attending the parade and to provide them uninterrupted passage to the venues and their hotel, certain roads are advised to be avoided by the general public. Commuters are also advised to leave 30-40 minutes early to avoid traffic. The Republic Day parade will start at 9:50am from Vijay Chowk and proceed towards the Red Fort Grounds through the Rajpath, India Gate, Tilak Marg, Bahadur Shah Zafar Marg and Netaji Subhash Marg. Traffic will be prohibited from January 25 in the area within the South Avenue T-Point, Tyag Raj Marg, Kamraj Marg, Man Singh road, Akbar road (between Man Singh road and the C Hexagon), Dr R P road, Red Cross road, Sansad Marg, Imtiaz Khan road, Rakab Ganj road, Pt. Pant Marg, Church road up to the Church Road-North Avenue T-Point, Joint Commissioner of Police (Traffic), Garima Bhatnagar, said. Traffic will be restricted from 6am till the parade ends in areas bound by the Kautilya Marg, Kamal Ataturk Marg, Dr A P J Abdul Kalam road, 'Q'-Point, Humayun road, Subramania Bharti Marg, Mathura road, Bhagwan Dass road, Mandi House, Feroze Shah road, Tolstoy Marg, Sansad Marg, Patel Chowk, Ashoka road, Baba Kharak Singh Marg, R M L Mother Teresa Crescent up to 11 Murti and Sardar Patel Marg up to Kautilya Marg, she said. The alternate routes suggested are the Aurobindo Marg-India Gate-W-Point-Vikas Marg for east side movement and Aurobindo Marg-AIIMS-Ring Road-Moti Bagh-Dhaula Kuan-Vande Matram Marg for west side movement. As a huge public gathering is expected around India Gate and Delhi Zoo on Republic Day evening, parking spaces would not be available. Visitors are thus advised to take the public transport instead of their personal vehicles. Traffic police personnel will be deployed in large numbers to ensure "minimum inconvenience" and "maximum facilitation", Chief Spokesperson and Special Commissioner (Traffic), Delhi Police, Dependra Pathak, said. "We have informed Google about the restrictions as several people use Google Maps. It will inform users about the alternative routes," he said. 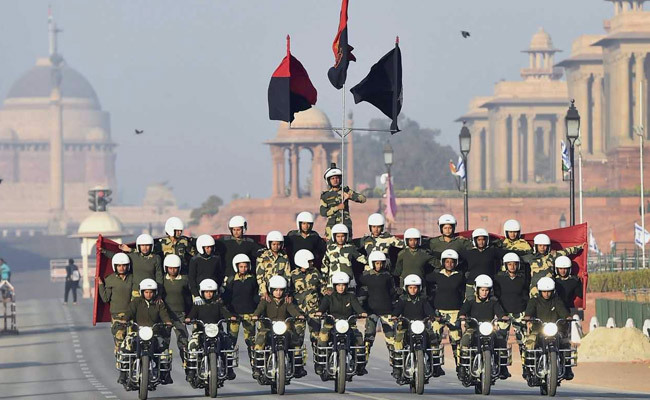 Traffic on certain roads leading to the parade's route will be restricted and vehicles will not be allowed on Rajpath from 3 PM on January 25 till the time the Republic Day event ends, she said. Ms Bhatnagar said that no cross traffic will be allowed on Rajpath from 11 PM from January 25. Rafi Marg, Janpath and Man Singh Road will be closed till the parade is over, the officer said. The 'C'-Hexagon-India Gate will be closed for traffic from 2 am on January 26 till the parade crosses Tilak Marg, she said. Entry and exit at Central Secretariat and Udyog Bhawan metro stations will be closed from 12:30 pm on January 26, and at Patel Chowk and Race Course metro stations from 8.45 am to 12.30 pm on Republic Day. The north-south traffic will be allowed from Ring Road, Aurobindo Chowk and Prithviraj Road. Traffic from South and East Delhi towards New Delhi railway station will be allowed on Mother Teresa Crescent and Boulevard Road via the ISBT over bridge, respectively, she added. No heavy vehicles will be allowed to enter Delhi from 10 pm on January 25 till the parade is over, and their entry from Sarai Kale Khan will be banned on January 26 from 7.30 am till 12.30 pm, the officer said.